Ever wonder what I'd look like as a zombie? No? Well there it is anyway. That's me, in all my zombie glory in feature film EXIT HUMANITY. Writen and directed by John Geddes, staring Bill Moseley (House of 1000 Corpses, Devil's Rejects), Dee Wallace (Cujo, E.T. ), Stephen McHattie (300, The Watchmen), narrated by Brian Cox (Braveheart) and introducing Mark Gibson. Exit Humanity is a zombie saga set in post-Civil War Tennessee. Exit Humanity was just released on DVD last week and when I finally got my copy, I was delighted to see my ugly mug decorating the DVD! 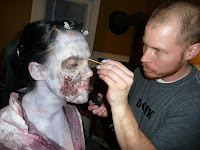 I had a chance to visit the set and get zombified when they were shooting in early winter of 2010, so I thought I'd share a few photos from the experience. 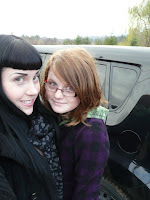 I did indeed show up looking relatively normal! See? Photographic evidence! 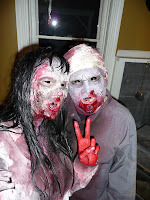 But then the Brothers Gore got a hold of me, otherwise known as Jeff & Jason Derushie. First came the black sclera lenses. Sclera's are specialty contact lenses designed to cover the entire corneal surface. In layman's terms, they're terrifying, huge and black out your entire eye for that extra creepy look. With some effort, and assistance, they went in and the transformation began. also got the paint treatment, using tooth enamels in blacks and browns, a quick and easy way to distort teeth without the use & cost of dentures. blood, also their own recipe, left me a delightful shade of hot pink for 2 days afterwards, the hazards of faux blood. It was a long day, which I'm certainly used to, but the uncomfortable sclera lenses and having a young actress with me, meant we had to bow out early. And by early I mean in the wee early hours of the next morning. I'm not good with contact lenses to begin with, but those scleras were so incredibly uncomfortable after several hours. I held on as long as I could, but had to ditch them for my last scene resulting in my being shot from behind. For anyone who wants to spot zombie me, you can find me on the back and spine of the DVD cover for the Canadian release, not sure of the US release (If you have it, let me know! ), and see me on the audio set up page in the DVD menu. I'm seen quickly a couple times in the trailer and film. When Bill Moseley's character has his soldiers thrust the unwilling test subjects arms (Jeff Derushie!) through the slot in the wall, that's me trying to get at him. Hello closeup! I'm also one of the zombies shambling around in the zombie pen, long black haired gal in the middle. 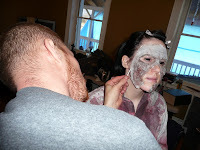 My fiancee, producer Steve Walsh, is also in that scene, he's the handsome zombie with the head bandage. All in all, it was a great expierence! Even just to experience a little bit of what actors who undergo transformative make-up on a regular basis go through. 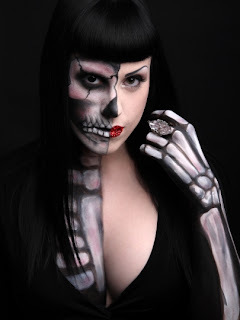 There's often been times where I've done make-ups that have restricted an actors movement, vision, or even ability to eat. I know it can be taxing, but now I have a bit of a better understanding, even if it was just uncomfy lenses I was dealing with. Now, if I can just be a vampire in a major feature film, my acting bucket list will be complete. Zombie. Vampire. The end. I'll stick to being behind the camera.